it must be reproduced in its entirety including this notice. RUSSIAN ROULETTE is gambling game. The stakes are high, you might say you bet your life! As I understand it Russian Roulette got its name from a practice the KGB used to elicit information from those they interrogated. Here's how it worked. A bullet was placed into one of the chambers of the revolver. Then the KGB agent would ask the prisoner for information. If he did not get a satisfactory answer, the cylinder was closed and then spun, the hammer cocked, the gun placed to the head of the prisoner and the trigger pulled. If the hammer came down on an empty chamber, the prisoner lived, at least long enough to be asked another question. If the hammer came down on the bullet in the chamber, the prisoner dead. Many died at the hands of the KGB playing Russian Roulette. Unfortunately, from time to time, we read about people who willingly play this deadly game. Perhaps it is played more often than we would like to think, because the people we read about are those who bet their life and lost. I remember well the story of an actor who played Russian Roulette and lost. It was in the summer of 1985. Between filming movie scenes, macho-man actor John Eric Hexum was just fooling around. He placed a blank shell in the revolver he was using in the movie. No doubt he thought that blanks were harmless. He spun the cylinder, placed it to his temple, pulled the trigger and blasted the wadding of the blank into his temple. He played Russian Roulette and lost. It cost him his life! By now, perhaps you are wondering, "What is the point?" Let me make my point clear. While it is highly unlikely that anyone reading this article has ever or will ever be foolish enough to play Russian Roulette with a revolver, I believe there are many who, this very moment, are playing RUSSIAN ROULETTE WITH THEIR SOULS! 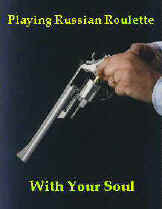 When I refer to "playing Russian Roulette with your soul" I am referring to those who gamble on their eternal destiny by either being ignorant of or ignoring what the Bible says about how to be saved from your sins and go to Heaven. The Bible says you can know for sure that you have eternal life (are going to Heaven when you die). 1 John 5:13 says, These things have I written unto you that believe on the name of the Son of God; that ye may know that ye have eternal life, and that ye may believe on the name of the Son of God. I've shared this Gospel of Salvation with thousands people over the past twenty five years. Praise the Lord, hundreds have trusted Christ as their personal Savior. But, many that I have witnessed to are playing Russian Roulette with their souls. They are gambling that they that they won't go to Hell when they die. Over the years I have seen 7 common ways people play Russian Roulette with their souls. I'm going to liken each one to a bullet placed into a gun. One of the counterfeit doctrines that Satan has used effectively to obscure Biblical Salvation is the false doctrine of infant baptism. This damnable doctrine has deceived millions of adults into believing that because they had water sprinkled on their heads in a church service when they were babies, somehow this makes them fit Heaven. That's a lie. There is not one single verse in the entire Bible that tells us that babies should be baptized. The truth is, only believers, those who have trusted in Christ, are commanded to be baptized and then that is to be by immersion (Acts 8:36-38). I'll never forget the first time I ran into this unbiblical doctrine. It was at a funeral. The person conducting the funeral waxed eloquent at the beginning of the service about this man's infant baptism. According to the comments, that somehow was supposed to make it possible for him to get into Heaven, provided enough candles were lit and enough masses were said. If the man in the casket believed that the speaker was saying, he had played Russian Roulette with his soul...and lost. My friend, if you believe that your infant baptism saves you from your sins and makes you fit for Heaven, then you too are gambling with your soul and you will lose. It seems to me that this is one of the most popular fallacies being believed today. I have had many people tell me that this is what they believe. One incident that stands out in my mind is my interview with a witch. I had asked he if she knew Christ as her Savior. She responded by saying that it did not matter whether you believed in the Great Spirit, Buddha or Christ, etc. because these all were paths to God. Popular or not, if you believe that there are many roads to God you are in for a shock the moment you die. You will find yourself in Hell and too late you will realize the truth of what the Bible says in Matthew 7:13-14. Enter ye in at the strait (narrow) gate: for wide is the gate, and broad is the way, that leadeth to destruction, and many there be which go in thereat: 14 Because strait is the gate, and narrow is the way, which leadeth unto life, and few there be that find it. There are many on the road to destruction. That is a broad road. But there is only one door to the narrow way that leads to eternal life and Jesus Christ is that door. John 10:7-9 Then said Jesus unto them again, Verily, verily, I say unto you, I am the door of the sheep. 8 All that ever came before me are thieves and robbers: but the sheep did not hear them. 9 I am the door: by me if any man enter in, he shall be saved, and shall go in and out, and find pasture. You are playing Russian Roulette with your soul if you buy the lie that there are many paths to God. There is just one path to God. That is through Jesus Christ the Lord. Allow me to repeat John 14:6 again -- Jesus saith unto him, I am the way, the truth, and the life: no man cometh unto the Father, but by me. During my first pastorate I met an interesting old fellow. He was around 80 and he shared many interesting stories about Michigan history with me. I witnessed to him time and time again to no avail. Each time he would relate to me how he had been a choir boy. That was the bullet in his gun. He was gambling that his good works as a choir boy would take him to Heaven. But they were worthless. Ephesians 2:8-9 tells us, For by grace are ye saved through faith; and that not of yourselves: it is the gift of God: 9 Not of works, lest any man should boast. Titus 3:5 says, Not by works of righteousness which we have done, but according to his mercy he saved us, by the washing of regeneration, and renewing of the Holy Ghost; John 3:16-18 makes it clear that only believing in Christ can save us from condemnation -- For God so loved the world, that he gave his only begotten Son, that whosoever believeth in him should not perish, but have everlasting life. 17 For God sent not his Son into the world to condemn the world; but that the world through him might be saved. 18 He that believeth on him is not condemned: but he that believeth not is condemned already, because he hath not believed in the name of the only begotten Son of God. The family called upon me to do the old gents funeral. It was a hard one to do, because the man had gambled with his soul and lost! What about you? Are you playing Russian Roulette with your soul? The grocery business sure has changed since I was a 4 year old. My parents used to take me to the little grocery store when they went shopping. They would sit me on the counter and then pick up what they needed in that four isle store. If things weren't too busy, the butcher would come out from behind the meat counter and talk with me. As I got older I would ride my bike the three or four blocks to that store and pick up things mom needed. I would always go back and talk to the butcher. He was my friend. In my late teen years I tried to witness to him. His response was, "I believe in God. We're all working to get to the same place. If we do the best we can I think we'll all get there Dave." That was his answer. That was the end of the conversation. He did not want to talk about it any more. He had loaded his gun with that lie and he was betting his eternal soul on it! May God yet open his eyes to the truth of the Scriptures! If you think that believing in God is going to keep you out of Hell you are gambling on a loosing proposition. One nationally known pastor said that he thought 50% of the people in his congregation who claimed to be Christians were not. I don't know about that, but I do remember a man who had been a Sunday School teacher, a trustee and a deacon in a Baptist Church where I had been the assistant pastor. I knew the man. He was busy for the Lord. I would have never guessed that he was not really a Christian. I a was surprised to learn that he had been playing Russian Roulette with his soul for almost 20 years. He finally give it up. He unloaded the gun and put his faith in Christ. He had made a counterfeit decision years earlier so he could marry a Christian girl. For years he was too proud to admit he was not really saved. Finally, after a major financial set back, he came to his senses and trusted Christ. Listen friends, Not every one that saith unto me, Lord, Lord, shall enter into the kingdom of heaven... Matthew 7:21 You can use His name, you can pray, you can read the Bible, sing in the choir, teach a Sunday School class, but if you have never confessed that you are a sinner, repented of your sins and personally put your faith in Jesus Christ, you are not saved! You are playing Russian Roulette with your soul. I urge you to respond to 2 Corinthians 13:5 Examine yourselves, whether ye be in the faith; prove your own selves. Know ye not your own selves, how that Jesus Christ is in you, except ye be reprobates? Matthew 7:15 warns, Beware of false prophets, which come to you in sheep's clothing, but inwardly they are ravening wolves. There are many false prophets, numerous false Christ's and bizarre doctrines are as prevalent as manure in a stockyard. Read and heed the words of the Apostle Paul, Galatians 1:6-9 I marvel that ye are so soon removed from him that called you into the grace of Christ unto another gospel: 7 Which is not another; but there be some that trouble you, and would pervert the gospel of Christ. 8 But though we, or an angel from heaven, preach any other gospel unto you than that which we have preached unto you, let him be accursed. 9 As we said before, so say I now again, If any man preach any other gospel unto you than that ye have received, let him be accursed. Listen to the words of the Apostle John -- 1 John 2:22 Who is a liar but he that denieth that Jesus is the Christ? He is antichrist, that denieth the Father and the Son. If you are have believed another Gospel than the Bible Gospel, If you have followed another Christ than the Bible Christ, if you are believing another doctrine than a Bible doctrine you are playing Russian Roulette with your soul! I was listening to Evangelist Fred Brown preach in Grand Rapids probably 15 years ago. He told us about an attractive teenager he had been witnessing to. He invited her to come to the evangelistic meetings and she came. It was obvious that she was under conviction, but she did not respond to the invitation. The evangelist met her at the back door and urged he to be saved, but she would not be persuaded. She said, "I've got too much living to do. Perhaps when I am older." He pleaded with her reminding her of 2 Corinthians. 6:2, Behold, now is the accepted time; behold, now is the day of salvation. She left without receiving Christ. Later that evening she was killed in a fiery car crash. Tragically, she had played Russian Roulette with her soul and lost. Some of you reading this message are doing the same things. Friend, the gun is loaded and you are pulling the trigger and sooner or later the hammer is going to come down on the shell -- BOOM...YOU ARE IN ETERNITY WITHOUT CHRIST, IN HELL, FOREVER. Romans 5:12 - "Wherefore, as by one man sin entered into the world, and death by sin, and so death passed upon all men, for that all have sinned." Romans 5:8 - "But God commendeth (proved) His love toward us, in that, while we were yet sinners, Christ died for us." believe in thine heart that God raised him from the dead, thou shalt be saved. For with the heart man believeth unto righteousness; and with the mouth confession is made unto salvation. For the scripture saith, Whosoever believeth on Him shalt not be ashamed." Why not call upon the Lord right now and ask him to Save you from your sins. I confess that I am a sinner and need your forgiveness. I believe that you, Lord Jesus Christ, died for my sins and rose again from the dead. I now trust only in you Christ to save me from my sins and take me to Heaven. Come into my life, forgive my sins and save my soul.